Seaside, a photo by Southworth Sailor on Flickr. I suppose that you could say that we honored Presidents Day since we were in 'Lincoln City' on Monday. 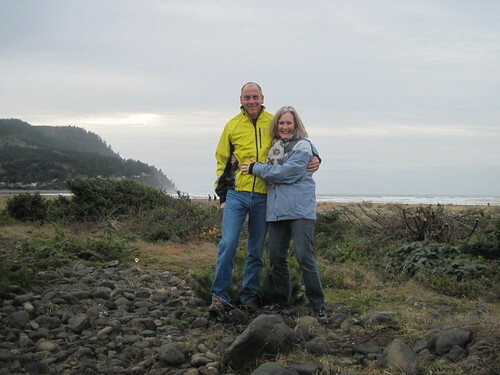 Esther and I took the opportunity of school free days to go to the Oregon coast. Our experience was similar to last year: one rain free afternoon, but the rest a soggy mist. Our dry afternoon was spent in Cannon Beach and Seaside. We enjoyed a walk on the Promenade and dinner at Doogers. On Monday we sludged our way down to the Lincoln City/Depot Bay area to check out Olivia Beach and Bella Beach. We were scouting out an alternative to our annual family Seabrook weekend. Both communities were not as nice as Seabrook, and given the greater distance for everyone to travel, we will probably cross it off our list of possibilities. We did get a great deal on a nice room in Lincoln City. We left our patio door ajar all night as we enjoyed the lullaby of the pounding surf. On Tuesday, we took a leisurely trip home, stopping in Portland for some time at Powell Books and the ReStore where Esther found some decorative 'treasures'.